Who does not want a good night’s sleep? But everything can be spoiled if you do not have solid wood beds to sleep on. With the advent of modernization, several forms of experimentation are going on, with regard to trendy and contemporary designs and styles for modern beds. 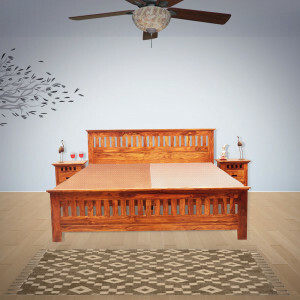 Solid wood beds in different floral, intricate wooden pattis and swing patterns, as well as geometrical styles are available on furniture store online. 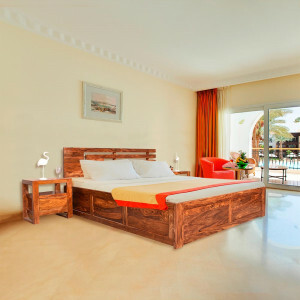 Whether it is a teak wood bed that you choose, or one that is made of Sheesham wood, it will instantly add elegance and style to your furnished bedroom. Single beds, double, king size and queen size beds are preferable even nowadays, when homeowners want to relish a sound sleep. Sparking up your love life would not have been much easier when you visit a reputed furniture store online. 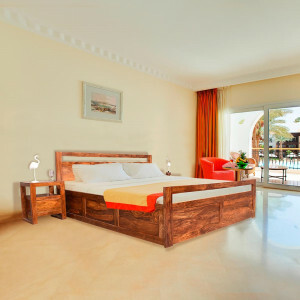 Whether it is your wife’s birthday, or your marriage anniversary, you can always buy solid wooden beds to pep up the living quotient in your bedroom. With Naveen Arts, what you get is not just your bedroom furniture, but warranty and quality craftsmanship, which is based on years of experience. When you go for online bed shopping, you can choose from various collections of double beds, divans or even wooden trundle beds if you have to customize the options as per the requirement of your kids at home. The beauty of your bedroom will be further enhanced if you have the solid Sheesham wood bedside accessories also, to complement your living style. Solid wooden beds or solid Sheesham wood beds with mattresses and storage spaces can be an ideal option if you want to store pillows, bed sheets and bedcovers properly. If you have a small flat and the bedroom is even smaller, then you can choose a wooden bed with storage to keep all extra things in an uncluttered manner. 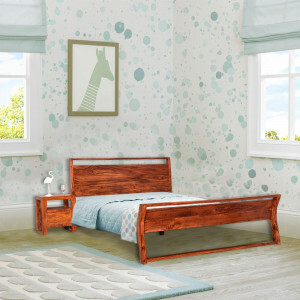 Solid headboards and footboards enable you to sleep well after a hectic day, and sleek and contemporary designs will encourage you to buy more wooden furniture online. At Naveen Arts, years of carpentry experience presents to you some of the best varieties of glazed and polished finishes. Solid wood beds, wooden accessories, dining sets, wooden study chairs, wooden drawers and mirrors with standard height and high quality natural or black finishes are easily available.